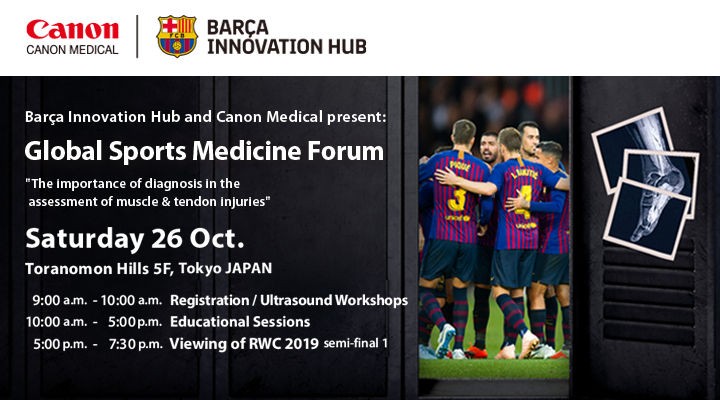 If you would like to attend the Global Sports Medicine Forum, please fill in the application form below. The program will be sent to your registered email address around August 2019. Items marked * are required fields. For the protection of privacy, Canon Medical Systems Corporation has adopted a Personal Information Protection Policy; information acquired through this website will be handled in full compliance with our policy. Personal data may be used for provision of information concerning products and services offered by Canon Medical Systems Corporation and its group companies. Within the above scope of use, Canon Medical Systems Corporation may outsource the handling of personal data to co-sponsoring companies, group companies, or external service providers. Customers may request disclosure, correction, or deletion of their personal information. To do so, please visit the Canon Medical Systems Corporation “Inquiry Page”. For our general policy on handling personal information of customers, refer to the “Personal Information Protection Policy” of Canon Medical Systems Corporation. Inquiries submitted on Saturdays, Sundays, New Year Holidays, and business holidays will be handled (at the earliest) on the following business day. To submit your application, check “Agree” to indicate that you accept our statement on the handling of personal information.